Liverpool manager Brendan Rodgers says his team can overturn a 2-0 deficit when they meet Zenit St Petersburg in the second leg of their Europa League last-32 tie. Zenit defeated the Reds in the first leg on Thursday thanks to two goals in two second-half minutes. "There is no way the tie is over - we are more than capable of getting the goals back," said Rodgers. "What gives us hope is that we created enough to win the game." Liverpool's Luis Suarez was guilty of squandering several chances; missing from five yards and failing to hit the target despite being clean through in the first half. He also shot wide on two other occasions. "He could have had a hat-trick by half-time," added the 39-year-old manager. "It wasn't his night but he's been brilliant for us all season." Zenit coach Luciano Spalletti echoed Rodgers's sentiments, warning his team that Liverpool's fans were capable of inspiring their side to victory. Meanwhile, Rodgers thanked Zenit fans for creating a "wonderful atmosphere" inside the stadium. Liverpool had written to European football's governing body Uefa and the Russian club "expressing their concerns" over the potential threat of racist abuse. 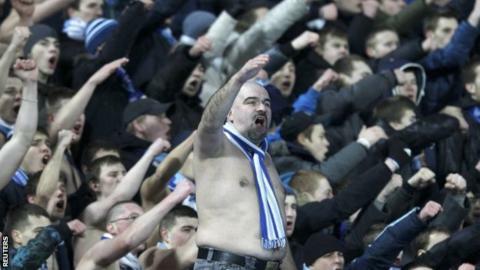 In December, a Zenit fans' group called for non-white and gay players to be excluded from the team. Rodgers said: "I can only thank the club for how we've been received. "I read and heard a lot about Zenit St Petersburg as a club, city and people before we got here. "There were no problems at the game, it was a wonderful atmosphere and we want to thank the people of Zenit and Russia."